Lee Da Hae and Park Yoochun from MBC drama “Miss Ripley” stated their official statement as to why they did not attend the celebration party (T/N: for the end of the series). Depicting the ruin of woman through her lies, “Miss Ripley” has become a public discussion with it’s non-persuasive change in composition of the drama and its characters.The last broadcast was on July 19th and the actors and crew organized a party to which the main actors did not attend and this has, once again, become a controversial topic of discussion. MBC Monday/Tuesday drama “Miss Ripley” ended with the drama rating #1. The results from the rating company AGB Nielsen Media Research, “Miss Ripley” that aired on the 19th got 15.4% of the national rating. It was a 0.4 point up from the day before, which was 15%. “Miss Ripley” has made a critical difference from the SBS drama “Warrior Baek Dong Soo” which is becoming very popular right now, and protected and beautifully took the #1 spot. In the last episode, the conflicts between the main characters had forgiven each other and made a settlement. Jang Miri (Lee DaHae) forgave her real mother Lee Hwa (Choi MyungGil), and confessed her love to Song Yoohyun (Park Yoochun) from the bottom of her heart. Also she admitted all the suspicions at the investigation, and started a new life. It is always sad when the guy doesn’t get his girl. The story of Miss Ripley is based upon real facts, so the typical ending to most dramas in which the lovers are able to find each other and live out their lives together is not present here. So what meaning can we give for the way things turned out? around which the drama is built aren’t happy ones. There has to be maturing on the part of Jang Miri, and we do get a glimpse of this in her letter to her mother. She needs time to sort out all of the details that shaped her life in the past, and without this maturing she will never gain joy and fulfillment in her future. Jang Miri has destroyed chances for many people. Her actions have destroyed entire careers, but there are positives here, for she has also shaken her family out of their complacency and privileged attitudes. The greatest losses that she has inflicted have been upon her lovers, all three of them. Yes, I include her first love because his love, though unwanted, has been real. He learns the hard lesson of when to let go. The manager is motivated to resume his career as a doctor, the most natural place for him to be. The greatest loss is inflicted upon Song Yoo Hyun. He not only loses because of Jang Miri’s connection to his step-mother, but he also loses a portion of his respect and trust in his elders. His whole world is shaken from top to bottom. Miri’s needs completely blind him to the love for him that Moon Hui Joo possesses. It is hoped that he finally finds a love much deeper and lasting than his love for Jang Miri. Jang Miri inspires others to love her because of her ability to be a chameleon. She is a different person toward each person she touches. She also possesses a form of innocence because she is still a small girl inside. Children are survivors. They use their charm to disarm those around them. It is a natural, God-given, survival gift. In a childish adult this gift can get distorted into the habit of manipulation without regard for other’s feelings and no thought to the consequences of their actions. All is self. Miri absorbs other’s energy and resources in order to survive. She swallows up those around her, and her childhood friend will need to make a break at some time so that she can realize her own true potential. I am personally left with a hope that all of those who were touched by the woman portrayed as Jang Miri found their way to a better life, and that she was able to regain trust in her mother and trust in people. She deserved hope for a future with a man that she could love and respect. I want to thank our own Park Yoochun and his fellow actors for their honest betrayal of a deeply moving issue in our world society. Yoochun, you are a class A actor. Your portrayal of Song Yoo Hyun was magnificent. NEWS Miss Ripley OST Sells 20,000 Copies!! [News] Miss Ripley OST Sells 20,000 Copies!! Miss Ripley, After the Drama, is Also Popular in OST. Sells Out 20,000 Copies of the First Publication. 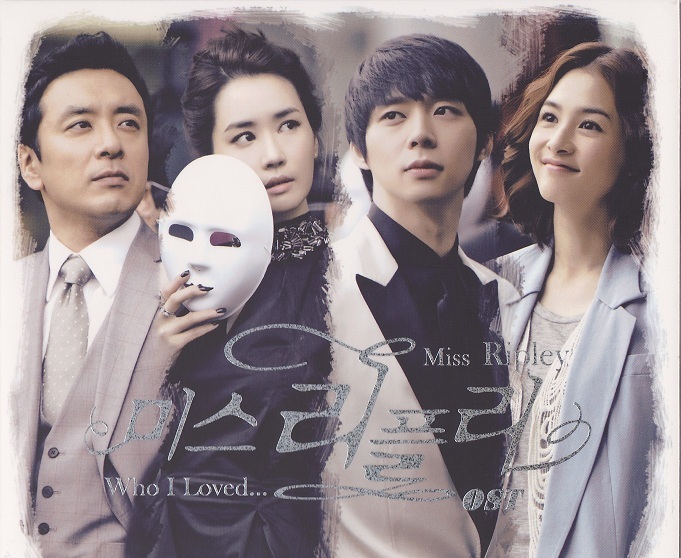 With the popularity of MBC TV’s Miss Ripley, its OST is also showing strength. The OST of Miss Ripley which was released last 4th sold out the 20,000 copies that were the first publication. Thanks to the popularity of Miss Ripley which claimed #1 among Monday-Tuesday dramas, the orders for the OST are pouring in not merely from Korea but also from Japan and Southeast Asia. In particular, there is high interest from the public with regards to Park Yoochun’s The Empty Space For You and Hwayoubi’s Glass which are included in the OST. The Empty Space For You which Park Yoochun sang showed off its power as soon as it was released by recording #1 in current-searched words in portal sites and #1 in current-rankings in major digital music sites. 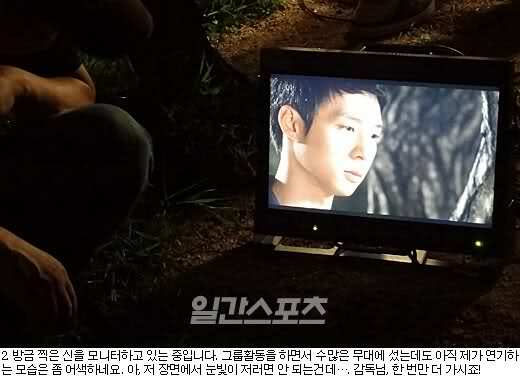 Park Yoochun hit a home run in his second challenge in acting as well and succeeded in advancing. It is that he is receiving praise in the recently-airing MBC Monday-Tuesday drama Miss Ripley in which he has again taken up the role of the lead, after he finished the initiation ceremony last year through Sungkyunkwan Scandal as a new actor. He has pulled off even the ardent inner-emotive acting which suffers after knowing the falsehoods of the woman he loves, Lee Dahae, and is receiving the evaluation that he has overstepped the limits of an actor whose origins is that of the singer. 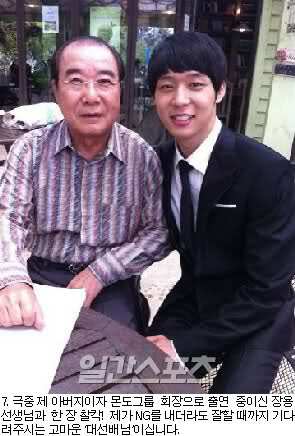 Park Yoochun who is stimulating the female heart as he plays Song Yoohyun who is the successor to a chaebol group and has innocence and a carefree attractiveness has revealed the set of the drama filming. Hello. 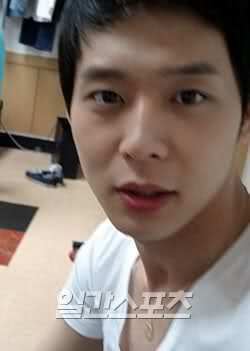 This is Park Yoochun. As for a while the JYJ World Tour and the filming for Miss Ripley coincided my body was a bit tired also. But as we get such good responses the fatigue just washes away. Even though it is acting that is still lacking you are lenient so I am thankful. In order to portray the sensitivity of Song Yoohyun who is doing his best in order to overcome his wounds, I have for a moment put away “Park Yoochun, the human being” and is only thinking of Miss Ripley as I live. Since I am very immersed in the character it is to the degree that I am worried about the process of coming back to regular life after the drama is over. As the drama is going to its end it is true that I am getting more and more busy. The filming set of our drama Miss Ripley which is run neatly even when everything is flying all over the place—I will show you. Speech bubble: Will the director-nim also be satisfied with this degree of acting? 1. I am immersing myself in emotions. You know that I am very wrought with worries in the drama nowadays, right? If one were to come to know of the fact that the past of the woman that he loves were all lies, what kind of feelings would he have. This is me getting into the character. Do you not feel the anxiety/tension as if one has stepped onto the stage of “I am a Singer”? 2. I am monitoring the scene just filmed. Even though I have risen on countless stages as I did activities as a group, it is still a bit awkward to see myself acting. Ah, it is not good to have the eyes like that in that scene… Director-nim, let’s have one more take! 3. 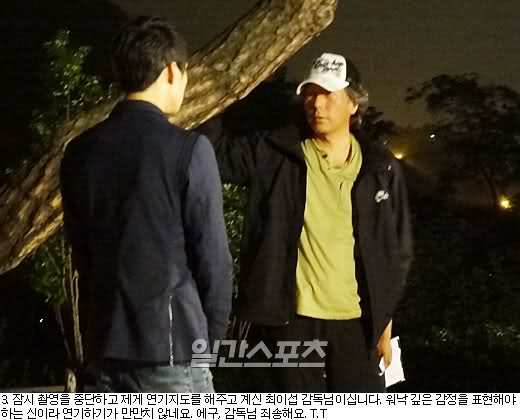 This is Choi Isub Director-nim who has momentarily stopped filming to give me acting instructions. Since this is a scene that requires expression of such deep feelings it is not easy for me to act. Oh I am sorry Director-nim T_T. 4. This is my having a fun date with Lee Dahae sunbae-nim. Ah, I wish that I could in reality meet with a girlfriend instead of dating in music videos and dramas. 5. This is the script of Miss Ripley. You see the highlighter marks that are meticulously checked right? 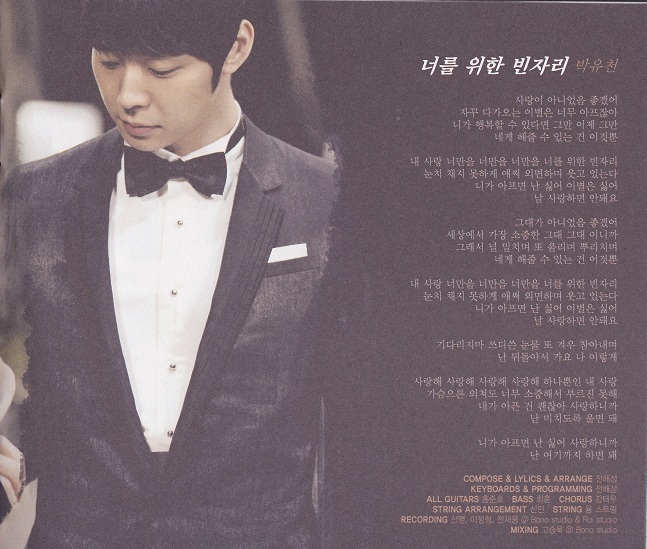 I am an actor Park Yoochun who looks and looks at the script over and over until it becomes ragged! 6. As I was waiting for my turn in filming in the waiting room I fell into a trance of playing by myself. This is what is called the “lazy man’s push-ups.” This is a method used when the body is tired but you feel that you should work out, sometimes. 7. A photo with Zhang Yong sunsaeng-nim who is appearing as my father in Ripley and the CEO of Mondo Group! He is a “big” sunbae nim who waits for me to do well even if I make NG’s. 8. “Oh, Awesome Man!” Do you not feel the wild appeal? 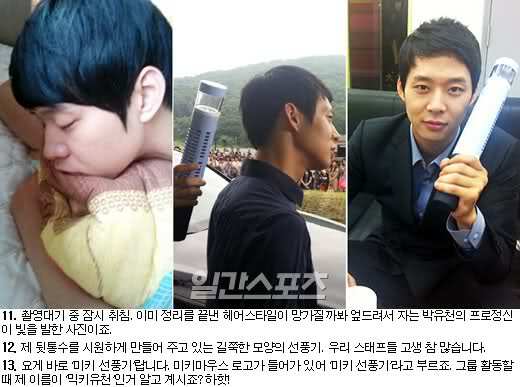 This is the true nature of the “male” Park Yoochun. This was a difficult scene because a complicated emotion had to be present along with having to keep your muscles firm. 9. This is the open set that was held in Yongin. Thankfully, in order to see me, this many Japanese fans came. I am so thankful because they watched the filming with order. 10. Choi Wonsuk Director-nim of Team B is teaching me the line of movement. Outdoors filming on a hot summer day is so difficult. The woman behind me is my stylist, who is wiping off the sweat that pours without cease. 11. Sleeping for a bit while waiting for the filming. This is a photo that makes the professional spirit of Park Yoochun shine, who is sleeping with stomach down lest the hair that is already styled may get mussed. 12. A rod-shaped fan that is making the back of my head cool. The staff is really working hard. 13. This is the “Mickey Fan.” It has a Mickey Mouse logo and so we call it a “Mickey Fan.” You do know that when I am working as a group my name is “Micky Yoochun,” right? Haha! [Trans] 110709 Park Yoochun-Lee Da Hae Bring In Fans And Beverages To Battle The Summer Heat “It’s Hot, It’s Hot~”The leading roles of MBC’s ‘Miss Ripley’ have been caught fighting a fierce battle with the heat. These actors, who are filming for the drama despite the temperature inching over 30℃and the continuous monsoon rain showers, are fighting the heat in their own ways. The burning summer heat is one of the worst troubles for actors and thick, black umbrellas are a must for actors filming scenes outside in order to escape the blazing sun. Lee Da Hae uses a thick, black umbrella to block out the sun while turning on a portable fan to cool herself down. It has been revealed that the cute and small portable electric fan is the item Lee Da Hae uses the most to survive the blazing temperatures. Whenever she’s waiting for her turn or taking a break, she has her fan turned on, chasing away the summer heat. Kim Seung Woo is also another user of small, portable fans. To fit his title as a CEO of a hotel, Kim Seung Woo usually wears long-sleeved formal suits, meaning that he can’t help but feel scorched in the burning heat. Staff say that he has his fan turned on whenever he takes a break and cools his body down by drinking cool beverages. Park Yoochun, who is more susceptible to summer heat than most, is having a hard time filming outside because he sweats a lot. The lighting crew sometimes fan him with their large reflecting plates while the staff members who move around with him fan his face continuously with their own fans. Whenever a scene is over, Park Yoochun fans his face with his own hands in an attempt to cool down. MBC’s Monday-Tuesday drama “Miss Ripley” which is currently in the midst of airing, is now released as a novel. “Miss Ripley” is a story about a woman who accidentally tells a lie, which leads to one lie after another and ends up caught in a web of lies, a classic melodrama. With societal issues as its material, coupled with the strong elite cast of Lee Da Hae, Kim Seung Woo, Park Yoochun and Kang Hye Jung, it has been a hot tppic from its planning stage. Joint writer Kim Sun Young was responsible for the screenplay for “Miss Ripley,” and previously won best screenplay for a drama in 1994. 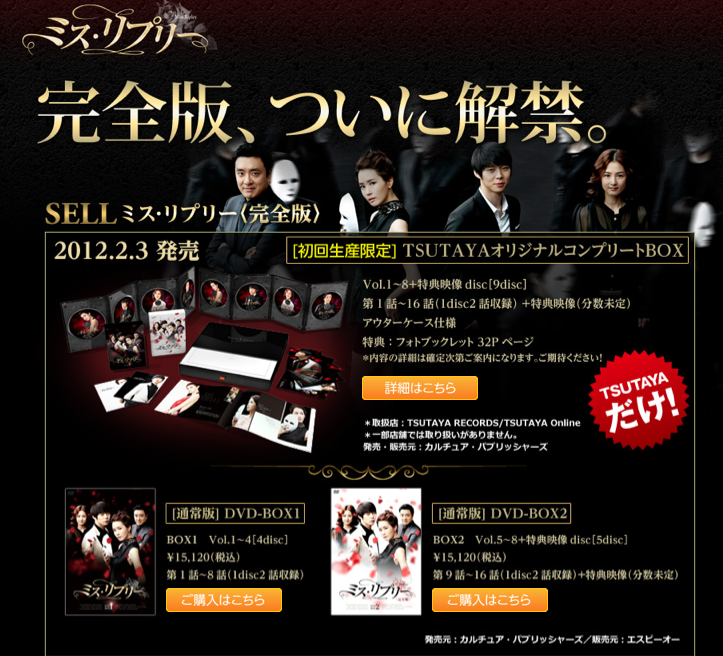 Also, through “The Season Of Puberty”、”Love & Farewell,” “Sleeping With the Enemy,” “Mr. Duke,” “Pretty Lady,” “Jang Hee-Bin” and other works, she has managed to gain much love from viewers. The other writer Sohn Hyun Kyung studied arts and culture during his university days and is very good at expressing a characters’ psyche and conditions. Among his works, he has released drama novels for “Lovers In Prague” (2 books), ” My Princess,” “Secret Garden”(Overseas Translated Version) and others. Park Yoochun, who is playing the role of conglomerate heir Song Yoo Hyun in MBC’s “Miss Ripley” said that he wouldn’t be able to accept the relationship if the situation in the drama happened to him in real life. On 7 July, the “Miss Ripley” site released a Park Yoochun interview video, in which he spoke about his role in the drama as well as his thoughts and issues faced when playing the character. Park Yoochun emphasized, “When I appear on the television screen, I feel slightly embarassed.” “And while I am on screen, my song plays in the background.It feels strange.” He said, showing his embarassment. Park Yoochun also said, “Although I would want to understand and accept her past, but to forget all this would indeed be difficult.” “If I accept her past, I would have to consider the pain that I suffer daily. If it were me, I wouldn’t be able to do it. It’s rather difficult.” He revealed in a straightfoward manner about what he would do if something similar had happened in real life, attracting a lot of attention. On July 6th, representatives of MBC revealed that they were in discussions for extending “Miss Ripley” for an extra two weeks. The drama is originally scheduled for a 16-episode run, which is set to conclude on July 19th. Should the drama be extended for another two weeks, it’ll have a total of 20 episodes and end on August 2nd. 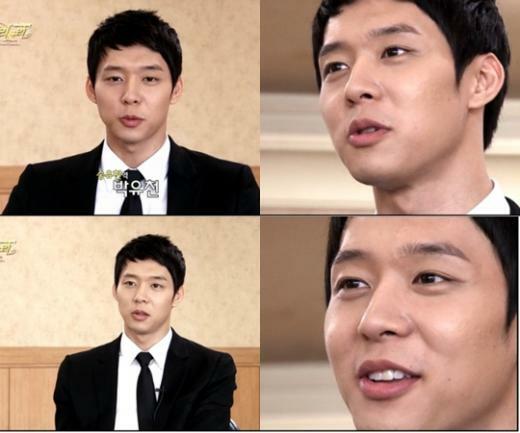 Park Yoochun mesmerized by the beautiful Lee Da Hae. On the 4th of MBC TV Monday-Tuesday drama ‘Miss Ripley’ 11th episode, it narrates the content of Jang Miri (Lee Da Hae) and Song Yuhyun (Park Yoochun) preparing for their engagement ceremony. Song Yuhyun disregarded the disagreement of mother Lee Hwa (Choi Min Ji) and insist on getting married with Miri. In order to bring forward the engagement, the two of them came to a bridal shop. Song Yuhyun saw Miri wearing a pure white wedding gown and showed a satisfied smile. He stood up from the sofa and gradually walked towards Miri, looking affectionately. Many viewers left messages saying, “Hopefully Park Yoochun can find out about Lee Da Hae’s lies as soon as possible.”, “Are they really going to engage?” etc. Additionally, Song Yuhyun has fallen deep in love with Jang Miri who he does not know anything about, and Jang Miri has once again lied and made used of sincere love. The fragility of their bubble-like love has aroused the curiosity of the viewers on when will it be ‘burst’.